Mirror, Mirror on the Wall , Who's the Best Biographer of Them All? By this time [Mar 1787] the World, the Morning Herald, the Public Advertiser, and the General Evening Post were agreeing with the Morning Post that Mrs. Piozzi was by far the best of Dr. Johnson's biographers. And if Werkmeister's book, published by the New York Public Library in 1963, was the only book you ever read about James Boswell, you might even believe that Mrs. Piozzi was still the best biographer of them all! 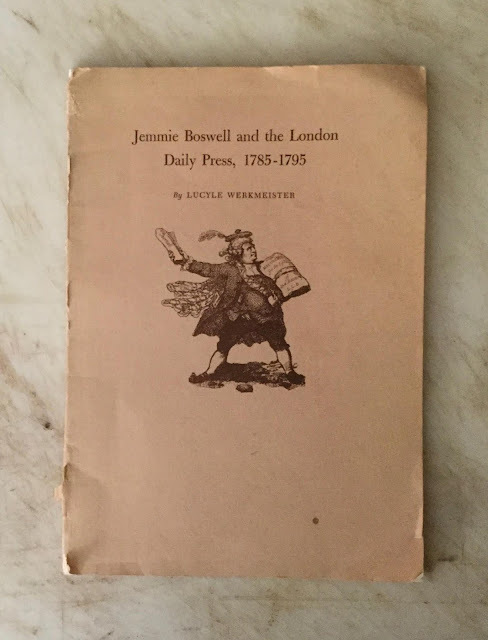 Werkmeister seemed to include in her book all the dirt about Jemmie Boswell that she could find from the London newspapers––and there was a lot. I do, however, question the veracity of her statements concerning the lack of positive reviews of Boswell's Tour and the Life. More on that later. But a little background is in order first, followed by a sequence of events and newspaper articles leading up to and after the publications of Mrs. Hester Piozzi and James Boswell. For the last twenty years of his life, Samuel Johnson was a frequent guest of Henry and Hester Thrale at Streatham Park, their home. Henry Thrale was the owner of a brewery. Of Hester Thrale, Johnson once said, "if she was not the wisest woman in the world, she was undoubtedly one of the wittiest." Her husband gave her journals in which she recorded the conversations and anecdotes of Samuel Johnson during his many stays at Streatham Park. She named these journals Thraliana. 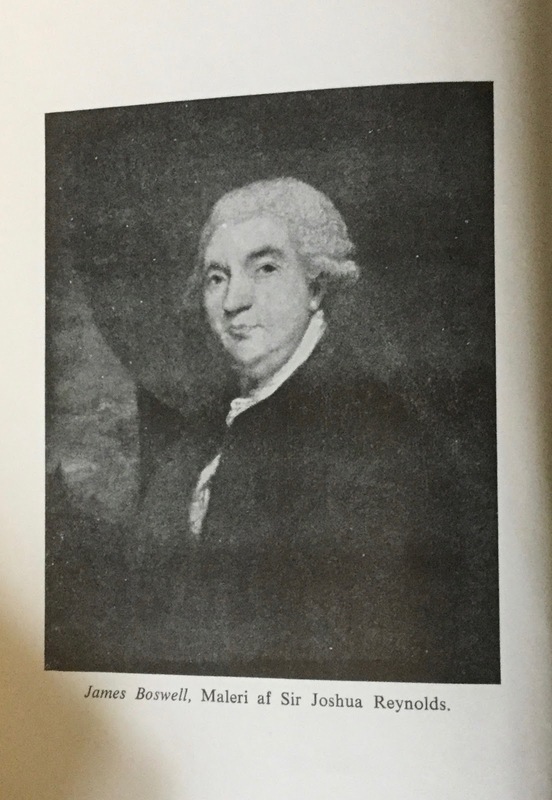 James Boswell sometimes visited Johnson at Streatham Park. 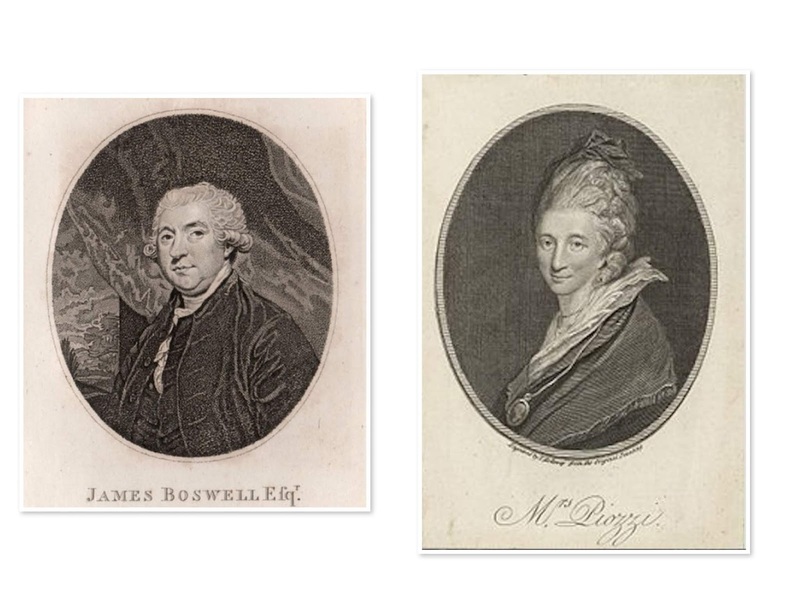 But Boswell and Mrs. Thrale were not friends. They were, in Boswell's own words, "friendly rivals". Mary Hyde called it "The Impossible Friendship" and wrote a book about it. There was a lot of heartache in Hester Thrale's life. Of her twelve children, eight of them died before the age of ten. Hester Thrale remained friends with Johnson after her husband died in April 1781. But Johnson had feelings for Mrs. Thrale and believed that she would continue to take care of him when he was ill. But life had different plans for Hester Thrale. She gradually fell in love with Gabriel Mario Piozzi, her daughter Queeney's music teacher. And on July 23, 1784, they were married. 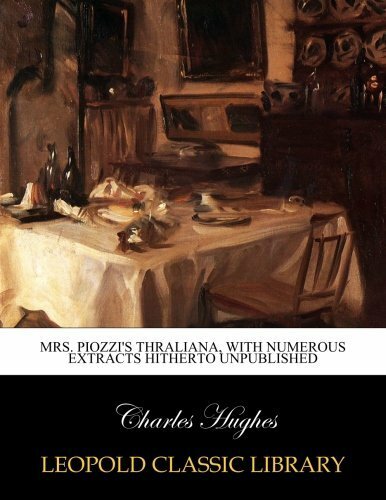 She sold the Thrale brewery, and the Piozzis sailed off to Italy. Boswell was furious because he thought Mrs. Piozzi had abandoned his friend Samuel Johnson. 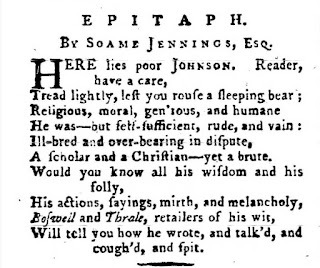 Johnson died less than five months later on December 13, 1784. There were many biographies of Samuel Johnson written before Boswell, Mrs. Piozzi, and Sir John Hawkins wrote theirs. Thomas Tyers was one of the earliest––if not the earliest biographer to write one after Johnson died. 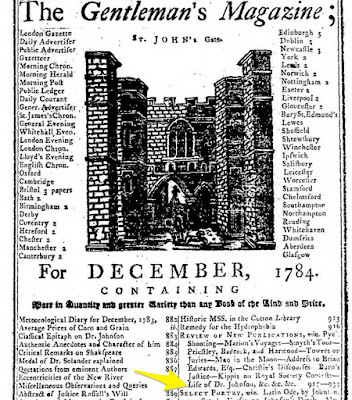 A Biographical Sketch of Dr. Samuel Johnson first appeared in the December 1784 issue of the Gentleman's Magazine, less than a month after Johnson's death. All who are acquainted with this Lady's domestick History must know that, in the present Instance, Mr. Tyers's Praise of her is unluckily bestowed. Her husband superintended every Dinner set before his Guests. After his Death she confessed her total Ignorance in culinary Arrangements. Poor Thrale studied an Art of which he loved the Produce, and to which he expired a martyr. Johnson repeatedly ... assured him that such unlimited indulgence of his Palate would precipitate his End. Little did he think his Intemperance would have proved an Introduction to his Wife's disgrace by eventually raising an obscure Fiddler into sudden wealth and awkward Notoriety. Mrs. Piozzi was livid! She believed without a doubt that Boswell himself was the author of the St. James's Chronicle articles. She called out Boswell by name in the manuscript of her upcoming book, Anecdotes of Dr. Johnson. Her friend Samuel Lysons was responsible for seeing her book through the press, but didn't get the opportunity to read her book until after all the sheets were printed. 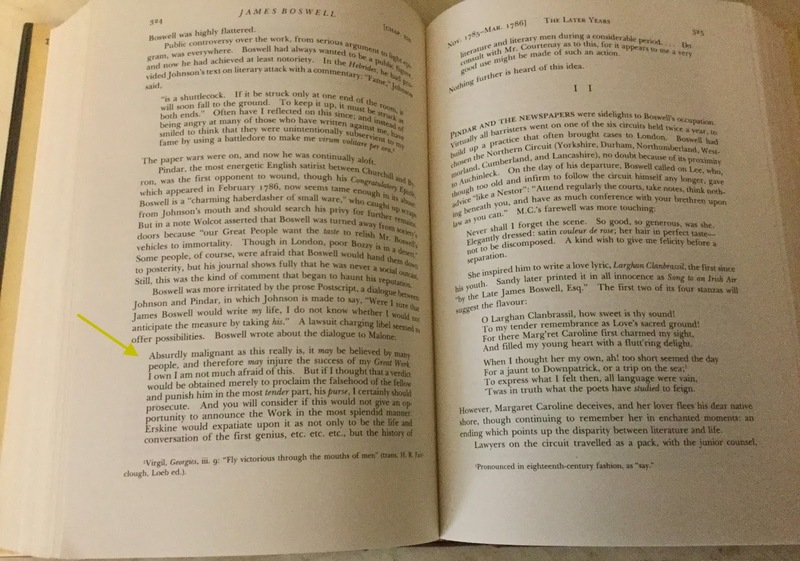 He did, however learn that Boswell was not the author of the articles, and managed to get Thomas Cadell, Mrs. Piozzi's publisher, to replace the offending blast with a cancel before the book was published. 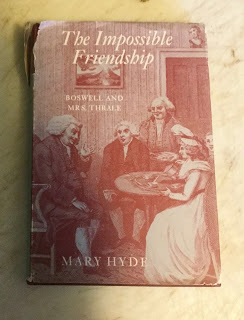 In her book, The Impossible Friendship, Mary Hyde wrote that "Boswell would have been astounded that he was responsible for her decision." Mrs. Piozzi didn't think she had enough material to publish a book about Johnson. All she had were her six books of Thraliana. But her belief that Boswell wrote the articles in the Saint James's Chronicle egged her on to publish her book. James Boswell did not live up to his promise. He sent puff pieces about himself and derogatory pieces about Mrs. Piozzi to the newspapers without putting his name to them. 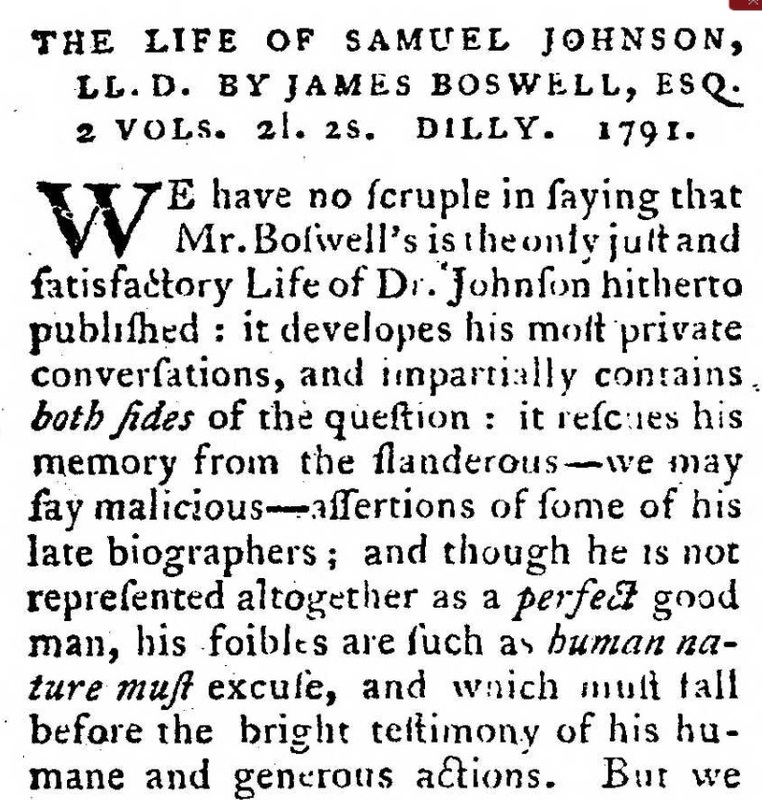 Boswell was nowhere ready with his biography of Johnson. He had only known Johnson for twenty years, and needed to research Johnson's early years before writing his book. But as an appetizer, Boswell offered his Journal of a Tour to the Hebrides with Samuel Johnson, LL.D. 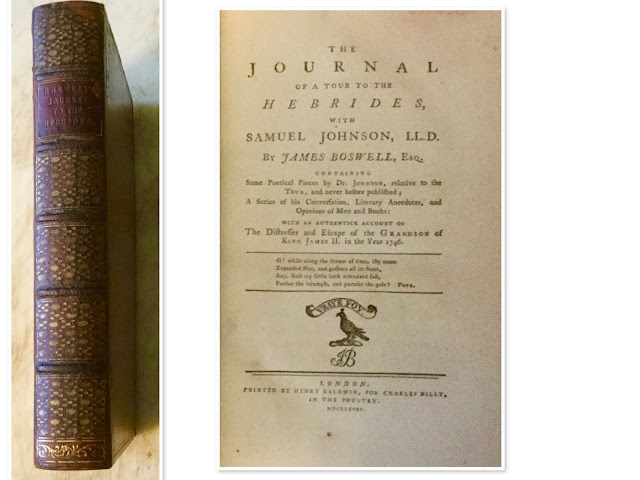 And after Boswell's friend, Edmond Malone, the Shakespeare scholar, helped him to revise it, Charles Dilly published The Journal of a Tour to the Hebrides with Samuel Johnson, LL.D. on Oct 1, 1785. 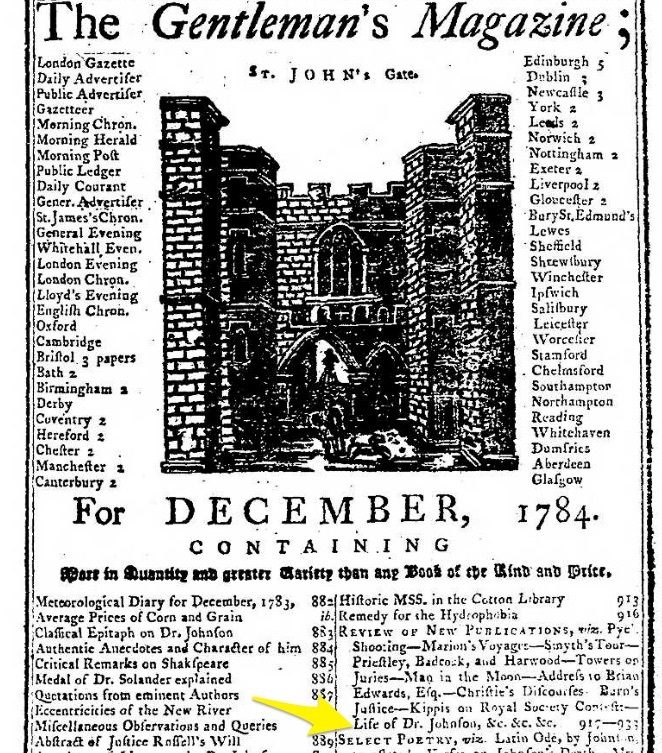 There were numerous notices of the Tour's publication printed in the London newspapers. And the public was aware of the upcoming publications of Mrs. Piozzi's Anecdotes and Sir John Hawkins's Life and Works of Johnson as well. The first edition of the Tour sold out in three weeks. 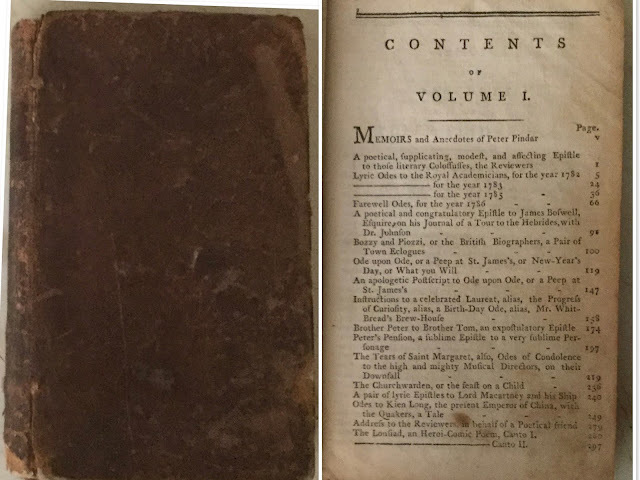 The second edition came out in in December 1785, and the third was printed in September 1786. Lucyle Werkmeister noted "some mutterings" about the Tour. 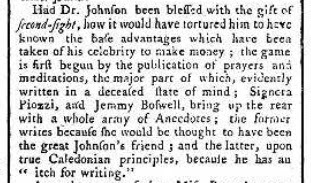 And she cited "part" of the first muttering from the Oct 1, 1785 issue of the Morning Post: "Had Johnson been blessed with the gift of second-sight, how it would have tortured him to have known the base advantages which have been taken of his celebrity to make money." Werkmeister clearly insinuates that the sole purpose of the publication of Boswell's Tour was to make money from Johnson's death. But Werkmeister purposely did not quote the entire article. There were several articles directed solely at Boswell during this time, and duly noted by Werkmeister, several of them being that Boswell was "destitute of original ideas." Werkmeister also noted that Boswell had "exhausted his "packet of puffs" that he himself wrote to the newspapers. 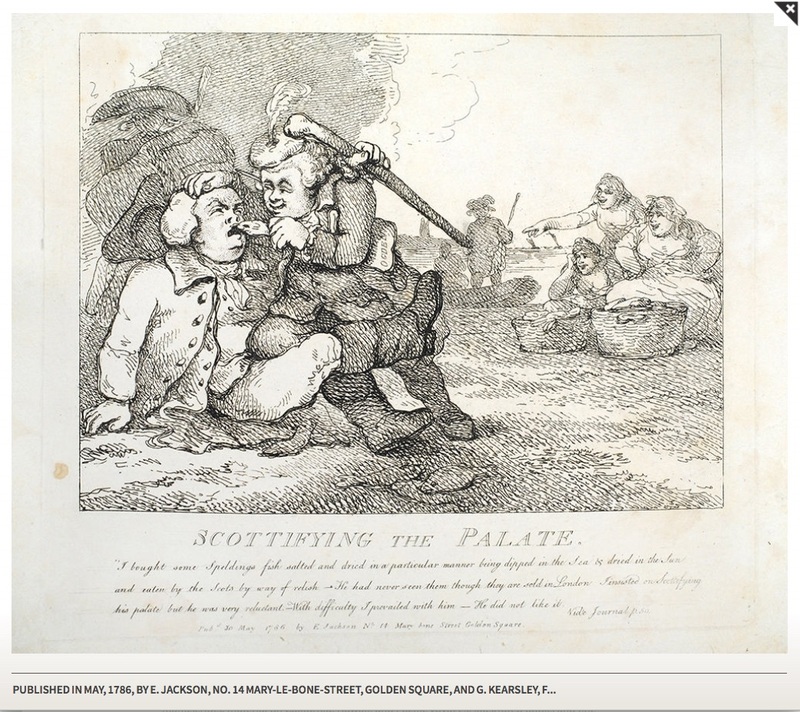 And "even though Boswell was back in London from Nov 17th to Dec 22nd, the Public Advertiser, the London Chronicle, and the St. James's Chronicle refused to print any more of his puffs nor defend him." Moreover, Werkmeister cited a Dec 21, 1785 article in the Morning Post that said Boswell was writing a pamphlet, A Defence of Mr. Boswell's Journal of a Tour, because he couldn't find any of the newspapers to defend him. Werkmeister, however, failed to mention that the European Magazine and London Review published an extensive review of the Tour in its December 1785 issue, which continued in its March 1786 issue. The author of the article emphasized that the book was more about Johnson's conversations and opinions than about a tour of Scotland itself. The English reader was not familiar with this kind of biography, and some readers were shocked. And afterwards, a few enterprising journalists turned that shock into ridicule. In February 1786, John Wolcott, writing under the pseudonym of Peter Pindar, came out with A Poetical and Congratulatory Epistle to James Boswell, Esquire, on his Journal of a Tour to the Hebrides with Dr. Johnson. Boswell was particularly upset with this line in the postscript of the poem,: "Were I sure that James Boswell would write my life, I do not know whether I would not anticipate the measure by taking his." I have the first volume of a 1794 New York edition of Pindar's works. 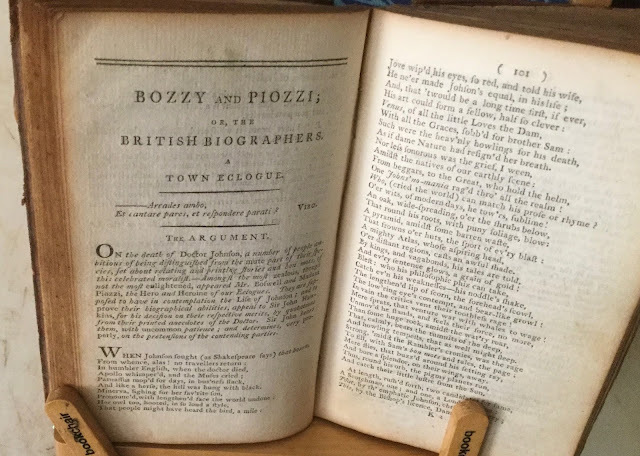 And it not only contains the Epistle, it contains Pindar's poem, Bozzy and Piozzi, or the British Biographers, a Pair of Town Eclogues which was published in April 1786 and ridicules both Bozzy and Piozzi. Werkmeister noted that Pindar's Epistle sold ten editions in three years and his Eclogue sold ten editions in two years. She also said that Boswell "fared much worse than Sir John Hawkins or Mrs. Piozzi." She also stated that because of her publisher, Thomas Cadell, Mrs. Piozzi had the support of almost all the newspapers. But not all of them. 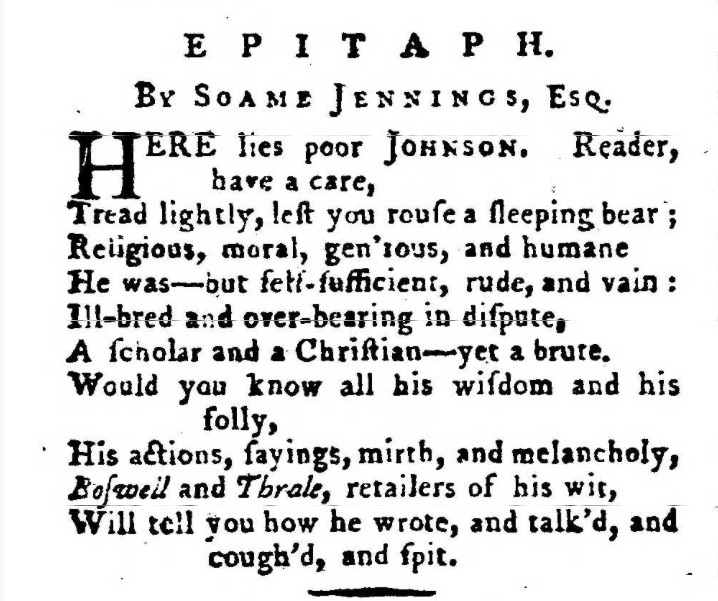 Mrs. Piozzi's Anecdotes of the Late Samuel Johnson, LL.D. was published on March 25, 1786. It was quite popular, going through four editions in the first year. The Morning Post, a friend to neither Bozzy or Piozzi, had a rather salacious way of informing the public of Mrs. Piozzi's book. In its Feb 3, 1786 issue it said, "Report frequently whispered that a connubial knot between Mrs. Thrale and Dr. Johnson––that event never took place, and yet Mrs. Piozzi and the Doctor are shortly to be pressed in the same sheets." Mrs. Piozzi's Anecdotes contained a necessary postscript that her friend Samuel Lysons inserted. 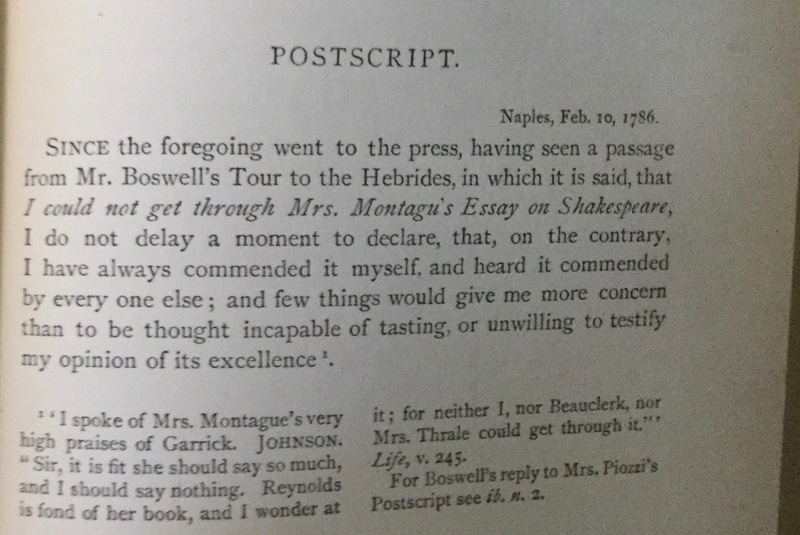 Lysons added the postscript in an attempt to explain away Johnson's comment in the Tour that Mrs. Thrale was not able to read Mrs. Montagu's Essay on Shakespeare: "For neither I, nor Beauclerk, nor Mrs. Thrale could get through it." 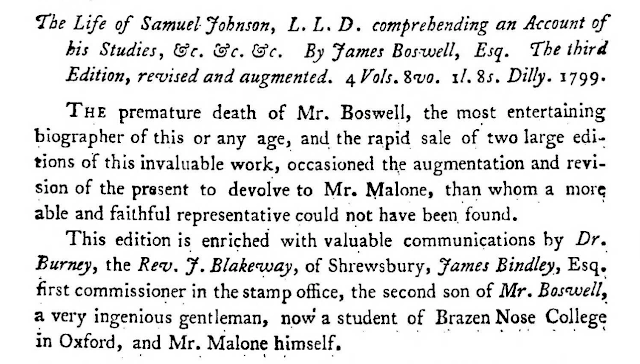 Werkmeister then went on to list most of the newspapers that published Boswell's reply. 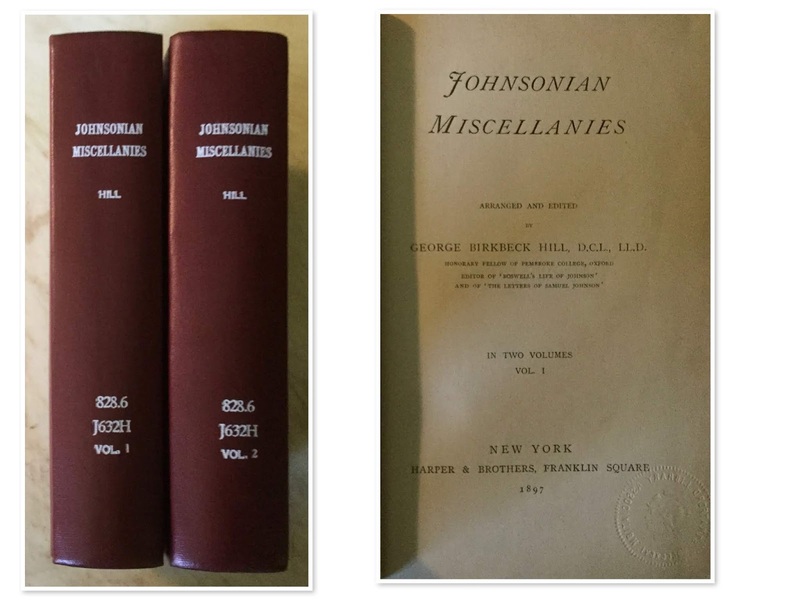 In his reply, Boswell italicized several words for added emphasis, "A considerable part of my journal, containing this paragraph,was read several years ago, by Mrs. Thrale herself, and returned to me, without intimating that Dr. Johnson had mistaken her sentiments." I have two books in my library that contain Mrs. Piozzi's Anecdotes: J. Wilson Croker's Johnsoniana; or, a Supplement to Boswell, published in 1842, and G. B. Hill's Johnsonian Miscellanies, published in 1897. 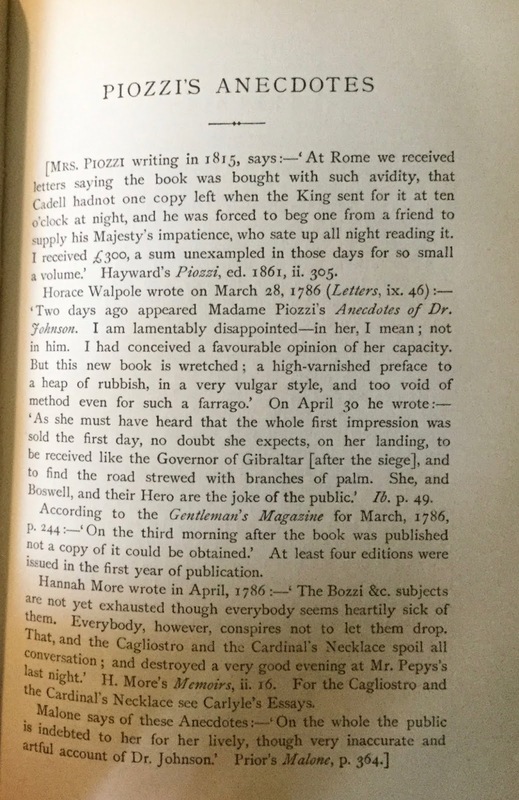 Hill inserted a review of sorts from Mrs. Piozzi, Horace Walpole, Hannah More, and Edmond Malone in a page before the Anecdotes. Boswell believed that Mrs. Piozzi had deliberately omitted anecdotes from her book that mentioned him so as to depict him as unmportant in Johnson's life. And he continued in attack mode to ridicule Mrs. Piozzi any chance he got in the newspapers. One of the "mutterings" about the Tour that Werkmeister did not allude to is "Remarks on Dr. Johnson's Character as given by his Biographers." This article appeared in the April 1786 issue of the Gentleman's Magazine. Anna Seward is reportedly the author. But the fidelity of Boswell's pen is as laudable as that of Sir Joshua Reynolds's pencil. If the world really desires to see what manner of man the great Doctor Johnson was, the stains of mailce and irascibility should, by the hand of friendship, no more be concealed in the pictures of his mind, than the unwieldiness of his limbs, and the deformities of his countenance, should be omitted in those of his person. After all, Mr. Boswell pronounces him good as great.––And also Mrs. Piozzi, after narrating a series of the most weakly-captious conduct, and unprovoked malice, with every glaring opposition to the meekness and forbearing spirit of the religion he professed, tells us that 'he was great beyond human comprehension, and good beyond the imitation of perishable beings." Thomas Cadell was Sir John Hawkins's publisher as well, and he delayed the publication of Mrs. Piozzi's Letters to and from the Late Samuel Johnson LL.D. until Hawkins's Life and Works of Samuel Johnson were published. Mrs. Piozzi's Letters was published on March 8, 1788. And on the same day, two of the letters were published in the Morning Post. 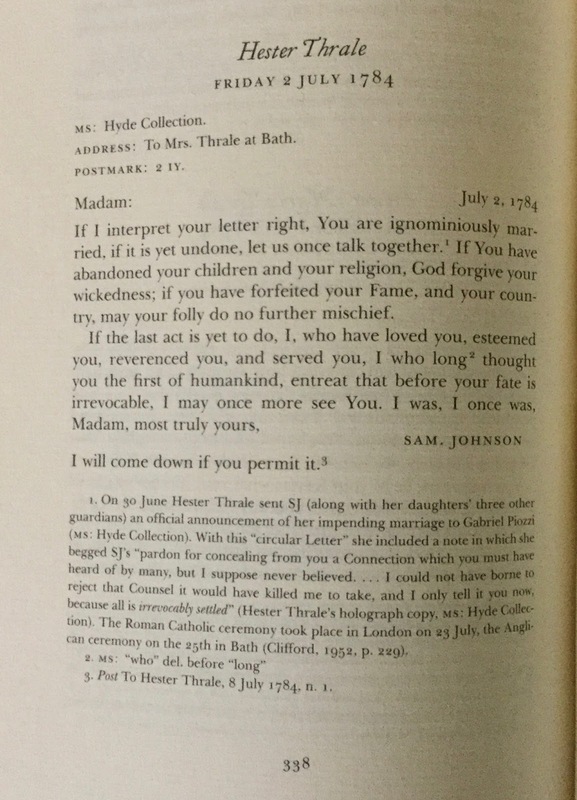 The first letter, dated June 30, 1784 was Mrs' Piozzi's request to Johnson that he give his consent to her marriage to Mr. Piozzi. The second letter, dated July 8, 1784, and reportedly being Johnson's original reply to Mrs. Piozzi begins, "What you have done, however I may lament it, I have no pretense to resent, as it has not been injurious to me; I therefore breath out one sigh of ten laments, perhaps useless, but at least sincere...."
Dr. Johnson's courtship of Mrs. Thrale, and his rage in being rejected for Signor Piozzi, which is said now to be promulgated by Baretti, is one of the most extraordinary things we have yet had concerning our great Lexicographer. Query, did Hawkins know this? does Boswell know it? what are we to believe? Why have we not a detail? Why not some document? Let us have all out. (Aug 14, 1788) Mr. Boswell, it is said, has abandoned his idea of writing a LIFE OF DR. JOHNSON, conceiving that by the ponderous biography of SIR JOHN HAWKINS and the epistolary publication of Madame PIOZZI, the venerable moralist has been thrown into ridicule, and that now the world would turn with disgust from the subject. (Dec 30, 1788) The nonsense about Mrs. PIOZZI is of the most nauseating kind. What would poor SAM JOHNSON say, if he could read the miserable trash daily vented about the wife of a brewer, whose pen was most suitably employed when keeping accounts of her late husband. 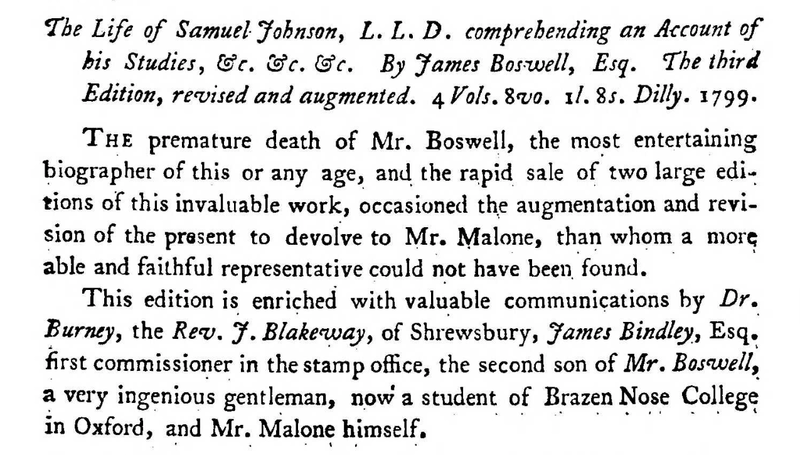 By November 1789, there was still no date when Boswell's biography of Johnson would be published. Edmond Malone was still helping him, but Malone was busy preparing his own multi-volume edition of the works of Shakespeare. Later that month, Boswell wrote to his friend, the Reverend William Temple, that he was 'in a state very much of despair." 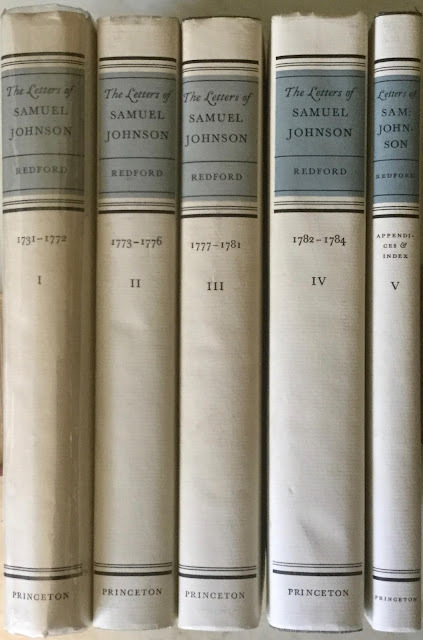 He still hadn't gotten over his wife's death the previous June from consumption, and had "several times considered giving up the writing of the biography of Johnson." On a positive note, "a third of the work is settled, so I shall get to press very soon." (?) question mark, mine! A third? In 1791, Boswell was beginning to see daylight on when his Magnum Opus would be published. But there were still delays. 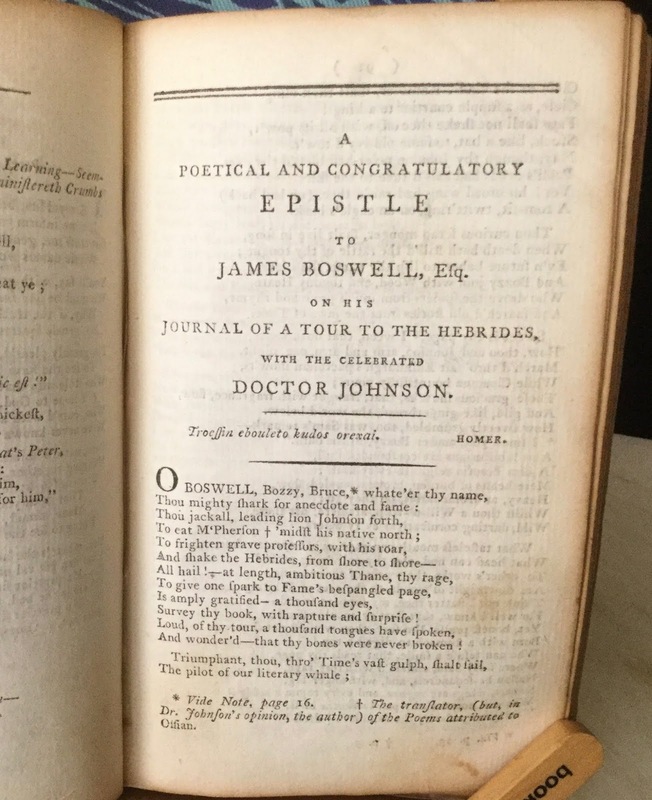 April 15th turned into April 25th, and finally a date of publication was set: May 16, 1791, the twenty-eighth anniversary of the day Boswell first met Samuel Johnson. And on May 16, 1791, the Public Advertiser announced these magical words: "Boswell's Life of Samuel Johnson, LL.D was published this day...."
Lucyle Werkmeister's account of the reviews of Boswell's Life of Johnson really really reflected her dislike of Boswell. 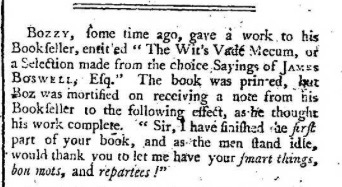 She mentioned a positive review that was printed in the Public Advertiser on June 18, 1791, and surmises that Boswell may have been the author himself. She stated that "the only serious review appeared in the Oracle of June 23, 1791." Werkmester included the entire seven paragraphs of the review, the tone of which can be summed up by the first sentence of the third paragraph: "The general complexion of the work is, to us, infinitely too minute." 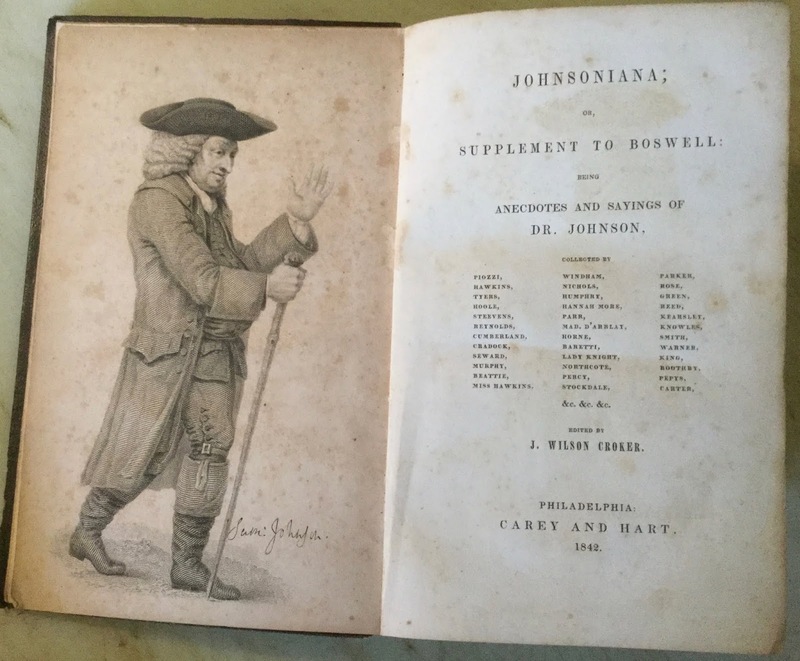 Werkmeister followed up with a Jun 24th quip from the Morning Post: "Mr. BOSWELL has been so enamored of his Life of Johnson, that he has read nothing else since it was published." Werkmeister added more quips, mentioned something about opposition newspapers and treasury newspapers, and then included four pages of extracts of a parody by Alexander Chalmers with a rather long title: LESSON IN BIOGRAPHY; OR HOW TO WRITE THE LIFE OF ONE'S FRIEND. (An Extract from the Life of Dr. Pozz, in ten volumes folio, written by JAMES BOZZ, Esq; who FLOURISHED with him near fifty years). Among the numerous parodies and jeux d'esprit which Mr. Boswell's work produced, this pleasantry from the pen of Mr. Alexander Chalmers, which appeared in the periodical publications of the day, is worth preserving; for it is not merely a good pleasantry, but a fair criticism of some of the lighter parts of the work. A prodigious root was made about the sale of BURKE'S reflections on the French Revolution. So much for Politicks and France. But for the honour of Literature and our own nation, it may gratify our Readers to mention that in the very first week of the publication of BOSWELL'S LIFE OF JOHNSON, no less than Six Hundred Copies of that work was sold. Now, as Dr. Price might have said, when we consider that one hundred of BOSWELL'S book, at Two Guineas, amounts to eight hundred and forty of BURKE'S book at a Crown, we shall find that the sale of the former in that space has been equal to the number of five thousand and forty of the latter; and it is also fair to take into calculation that in the proportion of purchasers, there is a greater probability of eight buying a Crown book than one buying a Two Guinea book. 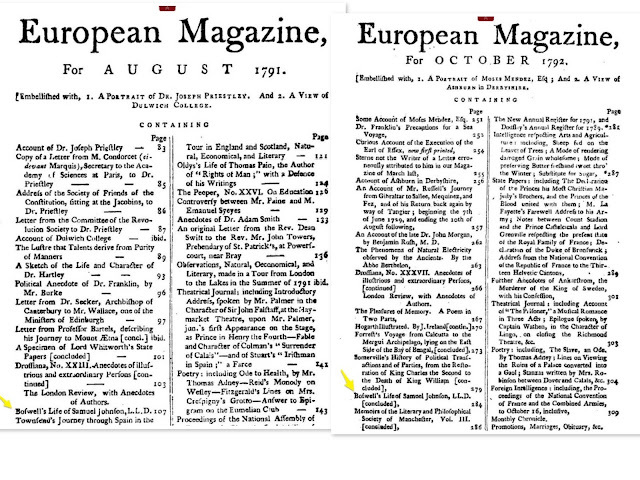 One of the most significant reviews of Boswell's Life of Johnson was performed by the European Magazine and London Review. Its lengthy review begins with the August 1791 issue and concludes with the Oct 1792 issue, each issue, except December's, containing about three pages of the book review. 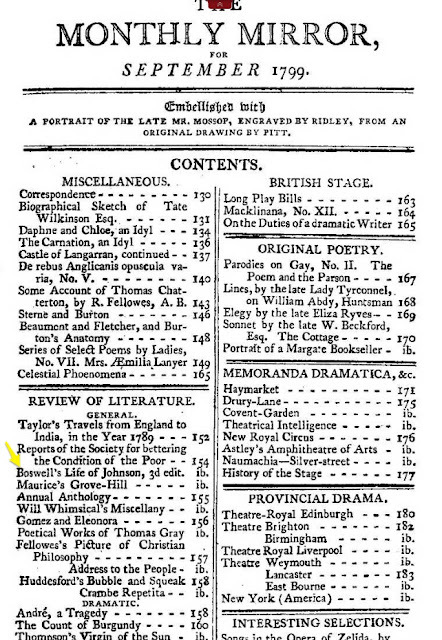 Another multi-issue review was published in the Historical Magazine beginning in June 1791. Now Werkmeister may have disregarded the reviews in the European Magazine and the Historical Magazine because they were monthlies and and not dailies. But the London reader of the day would have regarded these reviews as significant. Oh mirror mirror on the wall, I have one more review for you to ponder. And it is from another mirror! And the newspaper writers––God bless them––they couldn't resist leaving a parting shot either!